To get started, go to Signups / Manage Events. Add activities to your event. First we need to create the event. All activities will be grouped under events. Click the green Add Event button to get the window shown below. Title: Give your event a short title that makes it easy for a parent to identify. For example: if you are creating an event for a specific teacher, put their name in the title. Date: Date of the event. Leave blank if your event is not date specific. This date will display in the list of events along with the title and short description. Short Description: This will appear in the initial list of events and should be a quick one line description of the event. Contact Name and Email: This is the name and email that will display to parents when viewing the signup. 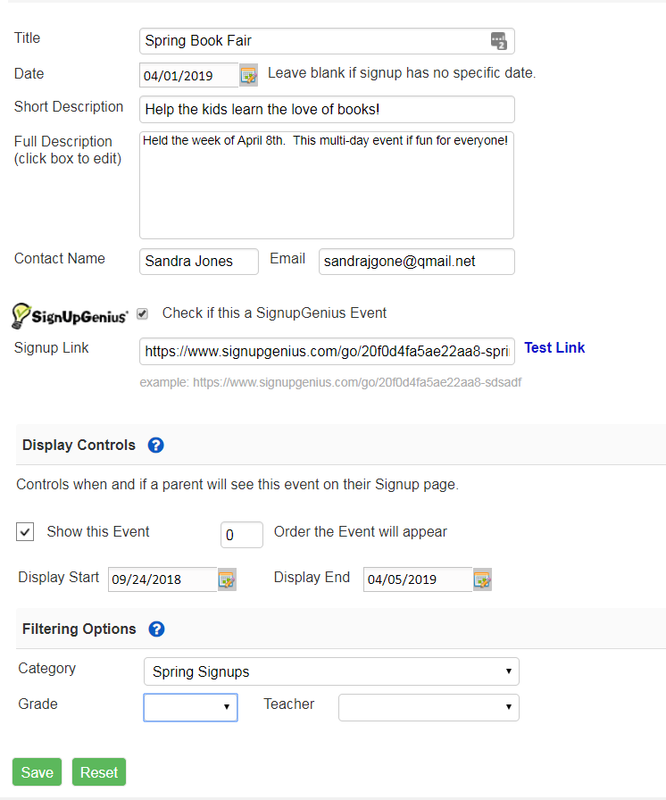 Display Controls: The following effect when and how this event will display to parents on the available signup page. Show this Event checkbox: check if you want parents to see this event. If this is an internal event and you don't want parents to signup, leave unchecked. Order: this controls the order the event will appear to parents on the list. The system will sort by this order first, then alphabetically by title. This is handy for putting more important events at the top of your list. Open and Close Dates: events will appear when the current date is between the open and close dates. You'll use these to control how long you want the event to display to parents for signups. For example: let's say you have a Halloween parade and you want parents to start signing up on October 1st but not after October 30th. Filtering Options: The following provide additional filtering for parents when viewing all open signups and for schools with lots of open signups - super handy! Grade and Teacher: You can link events to a grade and / or a teacher. 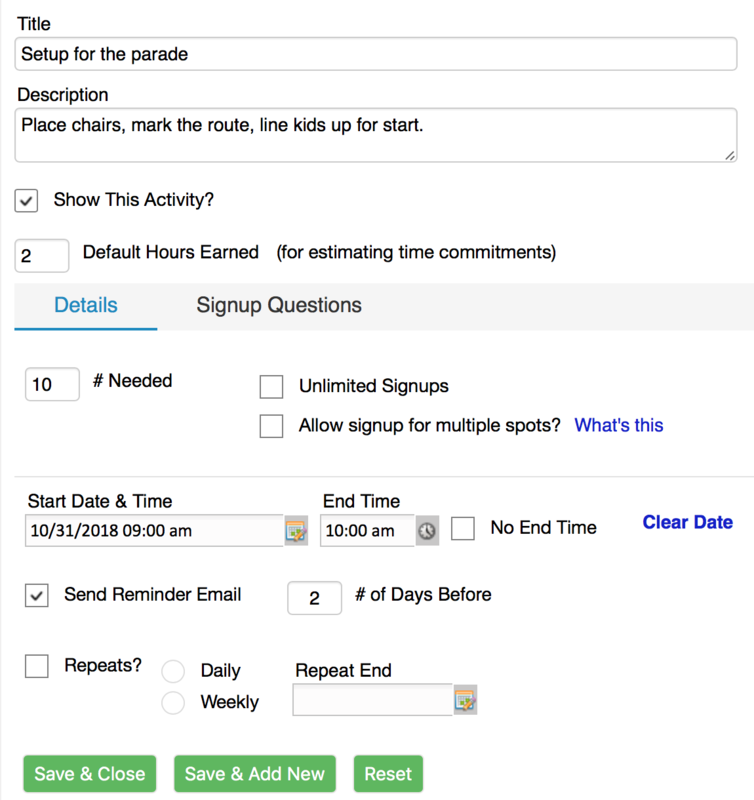 This helps parents filter the events on the signup page and is super handy when you use this feature for things like parent teacher conferences or you have a lot of events for your classes. Note: Pay attention to the options under Display Controls. If your event is not displaying to parents, check these options to ensure that they are entered correctly. Once your event is added you can then add activities. To add activities, click on the Activities button to the far right of the event listing. Description: Give a details about this activity letting folks know what you expect them to do or bring. Be as specific as you need. Show this Activity: do you want to display this activity to parents to allow them to signup. Check if yes. Leave blank if this is just an internal note or activity for the team. Hours earned: what are the default hours earned for this activity. This is a nice feature if you need to track your volunteer hours and don't want to bother parents with having to give them to you. Max Needed - put in a number if you want to limit. Once the limit is reached, parents can no longer signup for this activity. No end time - check if you don't need specified time slots. This is handy when you just need folks to show up and stay. Start date and time - put in the date and time for this activity. If there is none, you can leave blank. Send Reminder email and # of Days Before - this option will show if a date is entered above. Super handy to remind folks when they need to be available. This will trigger an automatic reminder X days before the activity date. Repeats? Use this feature if you have an activity that repeats and you want the system to automatically create an activity for each day. For example: you may have a library reader every Monday and you want parents to signup for the days they will be there. 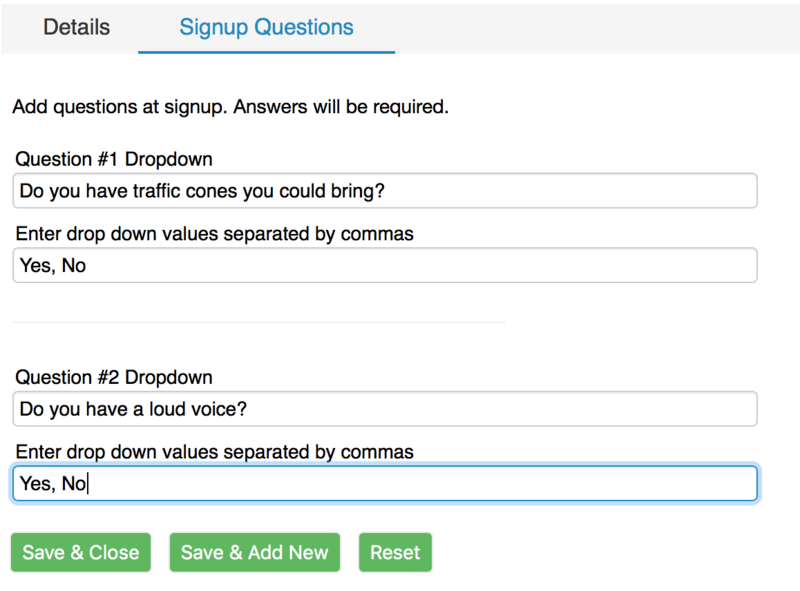 Signup Questions - You can require 2 responses. For example: maybe the event requires a tshirt and you need to have the volunteer select a size. These will become required fields. Tip: Before you start adding your activities, take a few minutes to plan out what you need help with. For example: let's say you have a 3 day event like a book fair and have 5 time slots that repeat each day. Use the Repeats? feature and create 5 activities checking to repeat each day, ending on the last day. To edit the activity, click the yellow pencil in the activity list. This will then expand the activity for editing. Make any changes needed and save. To copy an activity, click the Copy button and put in the number of copies you need. This will duplicate the activity. Note that this is different than repeating an activity which creates additional activities with different dates. To delete an activity (one or many) check the box on the far left of the listing and click the Delete button.